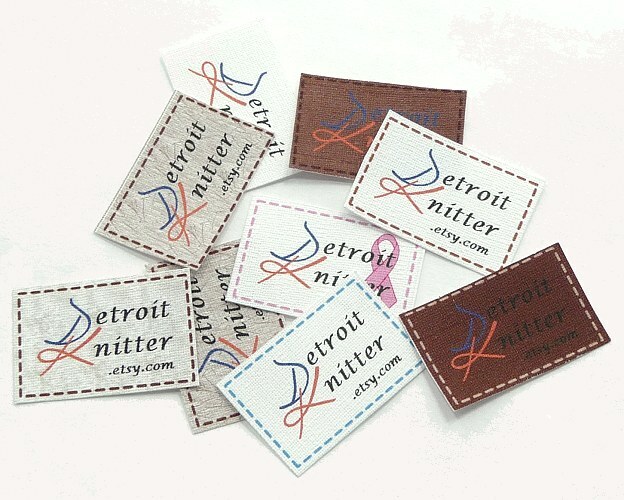 A while back I posted an extensive report on making your own clothing labels. Well, recently I've discovered yet another more simple approach to labels that I'd like to talk about. If you are looking for a tag that is not firmly placed on the fabric then this item is not for you. If you are looking for something easy to work with, is customizable and looks nice then the following information is for you. After my extensive research on clothing labels, I settled in on using clear iron-on transfer which I would tediously cut and then carefully set onto a piece of ribbon. 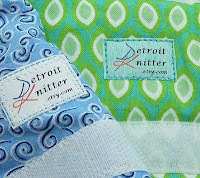 The ribbon was then sewn onto the fabric. This was working out fine and all except that 1) it was quite a bit of work 2) often times the transfer wouldn't peel off right 3) it could not withstand high heat. I did discover later that coating the label with clear fingernail polish would make it less prone to melting under hot circumstances, but that is certainly not a long term fix and again this added time to the production of labels. So, once upon a time I was randomly wandering around on Etsy sites and came across someone selling customized twill tape labels. They looked great and of course I pondered how this fellow knitter managed to make such labels. I admit I was stereotyping that being a knitter they were probably old and therefore lacking in modern day computer skills which would undoubtedly be needed to produce such lovely labels. Then of course I remembered that I too am a knitter and am not old and do have the know how to manufacture labels of this quality if I only knew the secret material. 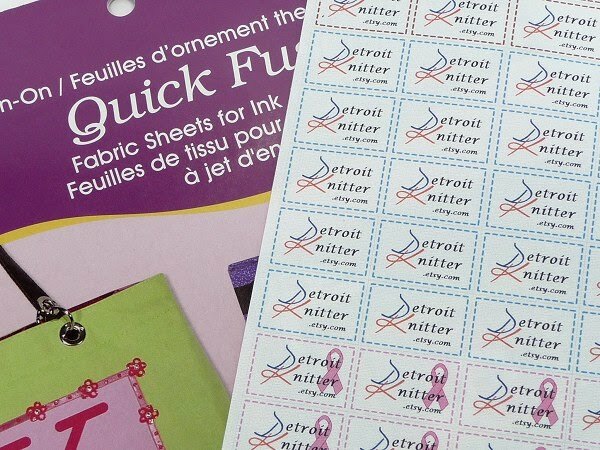 While my search for printable twill tape and how to print on twill tape weren't answered there at Jo-Ann's in the transfer paper section a light was shown down and led me on a path to simpler and less time consuming labels. 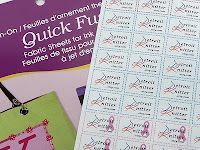 June Tailor "Quick Fuse" 100% cotton fabric with fusible backing sheets. 3 to a pack for $7.99. I whipped out my 40% coupon on went on my merry way. I can made 98 of my 1.75" x .75" labels on one sheet. Now some tips about using this stuff. Some printers will eat it! To avoid this roll a piece of fusible paper into a tube with the fusible stuff on the outside and the printable surface inside for about 10 seconds or so before putting into your paper tray - print right away! This will roll the leading edge up and hopefully your sheet with pull through your printer without incident. 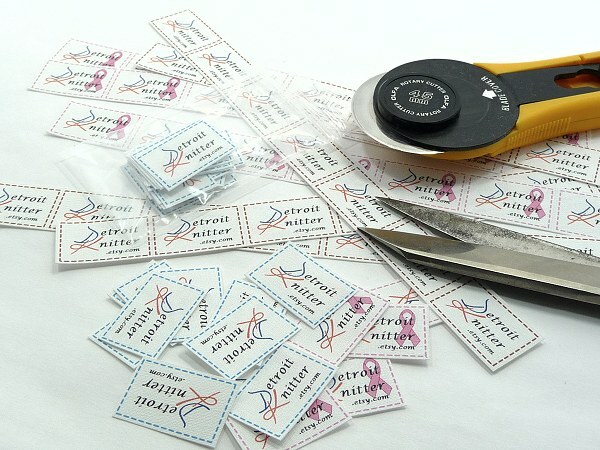 When laying out your labels it is helpful to add a border to aid in cutting. I add a border to 2 sides then using my photo program I set the grid to the exact dimensions of my label then use "snap to grid" placement. By having a border on only one edge you eliminate the possible double line cutting guide. You can use this stuff as simply an iron on, but I'm not so sure that it will really hold up over time. I say this because I've seen the edges curl a bit. I completely solve this problem by sewing around the label with either a straight or a narrow zig-zag stitch in addition to ironing it on. I like mine with a stitched on look. It takes away the cheesy factor of using an iron on. You can even include a stitched look right on your labels then use white thread to zig-zag it in place or use a matching thread and use the printed stitch as a guide. In addition to adding colored stitching, you can also color the background of the whole label for subtle or bold label color; I used a textured fill on mine rather than making them totally solid. This is one time that I can say "size doesn't matter". Make your label any size you wish. Be warned though that sewing it on does make tiny holes in the label and a really skinny one might look more like Swiss cheese when you're done.